I will now celebrate the release of Insurgent in theatres (which I haven't watched yet) by indulging in another of my story comparisons. When I was thinking so much of Divergent a few weeks ago, I naturally started connecting it with that book I always like to talk about, Jane Eyre. So now I will go over some of the concepts that appear in both books, or some of the things that stand out in Jane Eyre when you're considering it with Divergent in the back of your mind. Individual Strength - Jane Eyre is often spoken of in terms of independence: throughout her life, Jane makes a journey toward being self-dependent, even though she begins as a poor, plain woman without family or friends and would seemingly (in the context of her life) not be capable of independence. But she lets herself be educated, finds herself a job, falls in love, makes friends and finds cousins, and ends up with an inheritance that also gives her financial independence. Jane can and Jane does--likes Tris. Tris is raised to be selfless, to think of others before herself until her own identity is almost non-existant. She's young; she's small; and she does look pretty insignificant. But she decides to be her own person. She joins Dauntless and completes initiation, makes friends, falls in love, and acts in order to save both the community she is living in now and the one she grew up in. She does more than anyone would have expected--because she decides that she is capable. Reliance on Others - Although both of these stories stress the power of the individual to be in control of his/her own actions, they don't gloss over the significance of relationships and unity. Jane is very kept to herself and she's often in isolated places where there aren't many people to begin with. But the people she meets are significant toward her life. People help her: Helen Burns reminds her to be patient and take advantage of receiving an education, Mrs. Fairfax gives her a job, Rochester listens to her opinions, and the Rivers family (after saving her life) gives her more education and another job when she needs it. Jane, for all her perseverance, would be nowhere without other people. Likewise, Tris cares about other people, helps them, and receives help back. Christina in particular is very important in Tris's ability to feel at home in and worthy of being in Dauntless. A New Environment Can Be a Good Thing - Jane grew up in the shadows of her aunt's house and then in a pretty desolate boarding school. She didn't have much opportunity in either place--so she leaves. She advertises her teaching ability and gains the position of governess at Thornfield. There she is able to start a new life, earning her own living and being master over her own person. Tris did grow up with a family that loved her, but she needed more opportunity in her life: she didn't want to fade into the background of Abnegation. So Dauntless is her Thornfield, her opportunity to make her own choice about who she is and to be judged only by who she is, right here and right now. Understanding Someone Else in a Unique Way - I love that section in Jane Eyre when Jane and Rochester are talking about fairies and who knows what and Mrs. Fairfax is sitting with them and wondering what on earth they're talking about: they're speaking their own language to each other that only they can understand. They do that a lot. It's one of my favorite things about them because it makes them feel very suited toward each other. 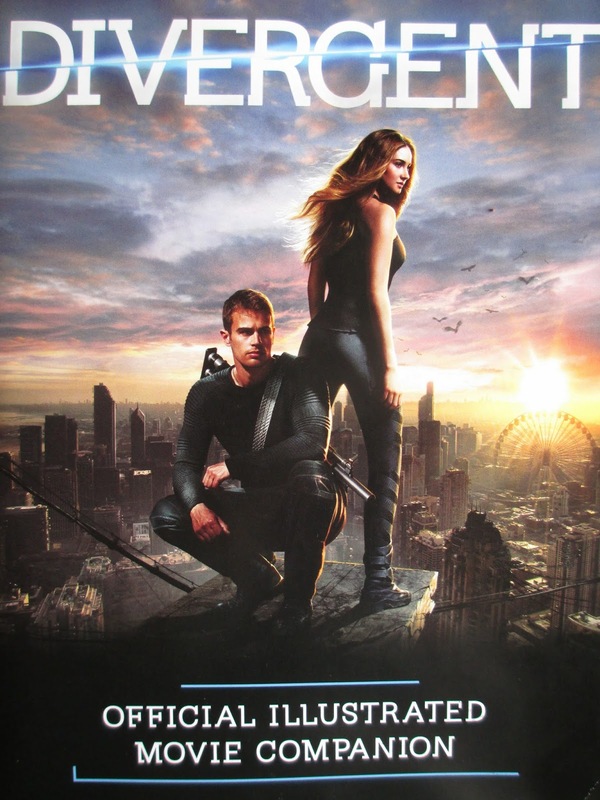 And it's rather like Tris and Four, who are both faced with what it means to be Divergent. They both resist the simulations, so they both find themselves different from the crowd--and like to each other. Mentorship, Friendship, and Love - Rochester is Jane's employer--she calls him "master" even after she leaves Thornfield. So, in a certain sense, he is above her, like how Four begins as Tris's initiation instructor. The difference (well, one of them) is that Tris never really alludes to the fact that Four was her instructor after initiation is over: that time was short, they're only two years apart in age, and there is so much else going on that it seems a very insignificant detail. The only thing that perhaps Tris keeps is the knowledge that, when most everyone else thought she wouldn't make it through initiation, Four always thought she was strong enough. Similarly, Rochester was essentially the first person who listened to Jane and her opinions and wanted to know what she was thinking and ended up encouraging her to be her own person (despite the fact that he twice tried to persuade her to do things that would make her his person rather than her own--but that's why she said no). That's why love is at its best, right? When both people encourage each other and the two can achieve more together than they could have done alone. 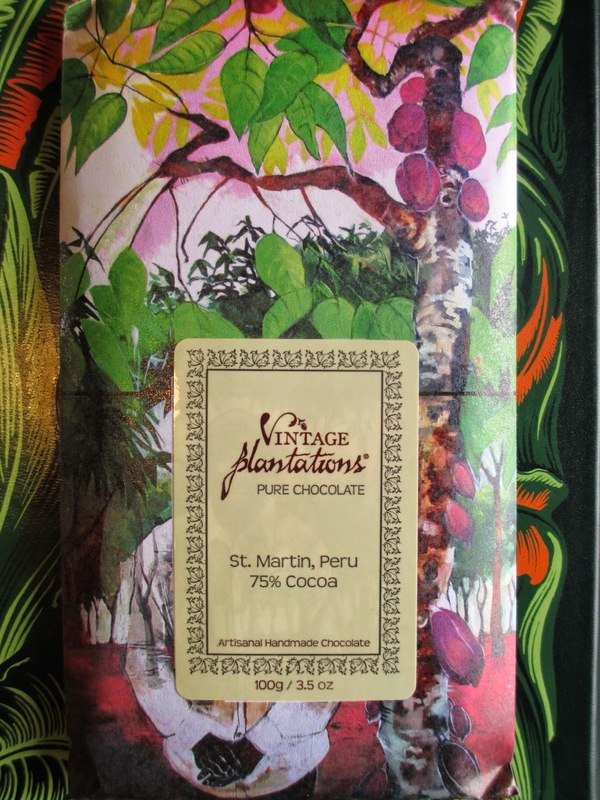 Vintage Plantations really does do some pretty packaging. The artsy green, purple, red-brown, and yellow shades of this paper envelope excite attention and bring that same attention back to the source of this chocolate, the cocoa plantation. You can see the purple pods growing off of the tree there on the right. I believe this is my third bar from Vintage Plantations. 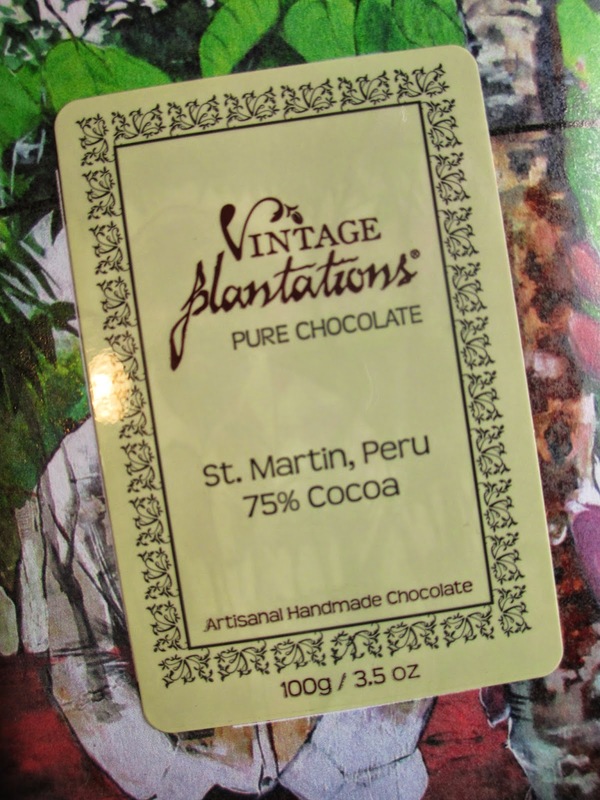 It's a standard cocoa content at 75%; the origin is St. Martin, Peru. Given what I have said before about the store where I've been buying these bars, I should have opened this one up as soon as I bought it: they tend to sit on those shelves for a while. But I guess I was so busy with other chocolate products that I let this one sit even longer, so that it is, sadly, now far from its prime. So no comments on texture or melting: it has turned kind of stiff with age, as chocolate does. But the flavors are still in there, so that is what I will turn the focus toward. This chocolate tastes exactly like the packaging. Bright and bold, yet with a deeper subtlety. I always describe cacao nibs as having a blue or purple taste--that's very similar to what I'm getting from this bar. That deep fruit richness, as opposed to the bouncier fruity notes of chocolate made with cocoa beans from Madagascar. It isn't bitter at all, which makes its depth smooth and tranquil. After you've had a few pieces, maybe you start to get just a hint of sugar sweetness (the only sweetener, of course, is organic evaporated cane sugar). The only other ingredients, I might add, are cocoa beans and some additional cocoa butter. No vanilla, which is a testament to how well Vintage Plantations can bring out flavor: most companies add vanilla. Honestly, I wasn't too excited on starting this bar (despite the pretty packaging) because I knew it was probably getting a little old. But I find that I'm still enjoying it: there is still so much more depth of flavor than so many dark chocolates have. I'm beginning to wonder why I don't see or hear more about Vintage Plantations; maybe it's because they're on the East Coast. Because, otherwise, they have so many factors right: organic, bean-to-bar, attention to the plantations, nice packaging, and depth of flavor. Sometimes I like to complain about how never mind all the places in the world and the country that I have never seen, there are so many places in my own state where I have never been. 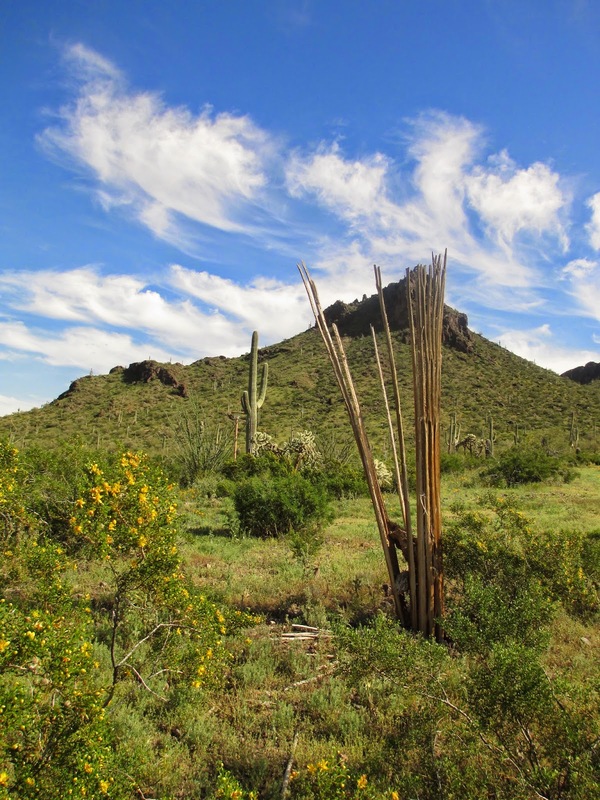 Picacho Peak State Park was one of those places where I had been wanting to go for a few years. It isn't that far . . . and when I was around the Phoenix area it was only an hour or so away . . . but it's still a long drive, especially since I am no longer around the Phoenix area. But last weekend I finally made it over. I don't think I had even heard much of the place until I read The Host--which is kind of ironic that a mainstream book would remind me of something in my own state. Then lately it seems like I've been hearing so much about how pretty the wildflowers there are in spring. I've seen pictures (better than any of the pictures I took, too, I might add), but I really wanted to be there in person. So we planned out trip for March. It was absolutely perfect timing. It's been such a wet winter that there were lots of flowers out and we also came just in time for mild weather. It was about 80 degrees when we were there; this weekend I think it's about 90. Perfect timing. The first view was our view from our picnic table; I think the above picture was from the same location, just pointing over to the left. We kind of didn't leave that early, so it was already lunchtime by the time we got there. So we took time over lunch, lingering around the table afterwards. If you've driven through this general area, you'll have observed that the plants tend to grow more on slopes than on the flat areas. Picacho Peak is part of a little ridge of sorts and the park is set up around this small line of mini mountains, so the cactus are growing all over. Saguaro and prickly pear and cholla. Especially with it being spring, everything was so very green. Add the wildflowers to that and it was just gorgeous. Don't make fun of us, but the only trail we walked was the Nature Trail (unless maybe we also walked partially on another one? I'm not sure). It was afternoon by this point (you know, the hottest part of the day) and we did have that long drive back afterwards and everything felt to pretty for anything other than a casual stroll. I mean, it was never the plan to go on Hunter Trail, anyway--that's the steep trail up to the peak with steel cables to help you along through certain sections. We were all dressed for a casual day, anyway. I wore sandals (a little more walking/outdoor style), long shorts, and a white open shirt over a tank top (white is a must--I was surprised to see quite a few people in gray or even black) with my hair in a side braid. Do you know those cloth bags Free People gives out? They're perfect for outdoor days; just throw in a water bottle, lip balm (I used Fresh's Sugar balm in Petal), and whatever else you need and sling it over your shoulder. It was just a really pretty day to spend outdoors in a really pretty place. On the way home, we stopped by Happy Valley for dinner. I've developed a strange affection for Happy Valley; it makes me happy there. Maybe it's because the new developments have so many restaurants. Even though the two books have absolutely nothing to do with each other, Gayle Forman’s I Was Here reminded me of Gaspar de Alba’s Desert Blood. When you’re reading both of these books, there are passages that just make you sick to read, that make you feel sick for even wanting to read this as fiction and for someone to have written it as fiction. And then you get to the ending and it’s like the whole point of all of this being in a piece of fiction was to spread awareness about a certain issue, to make you feel sick so that you can help this fiction not happen in reality anymore. And I get that—but I still don’t like it. This is no more than what the book jacket says, so I’m not really giving spoilers. 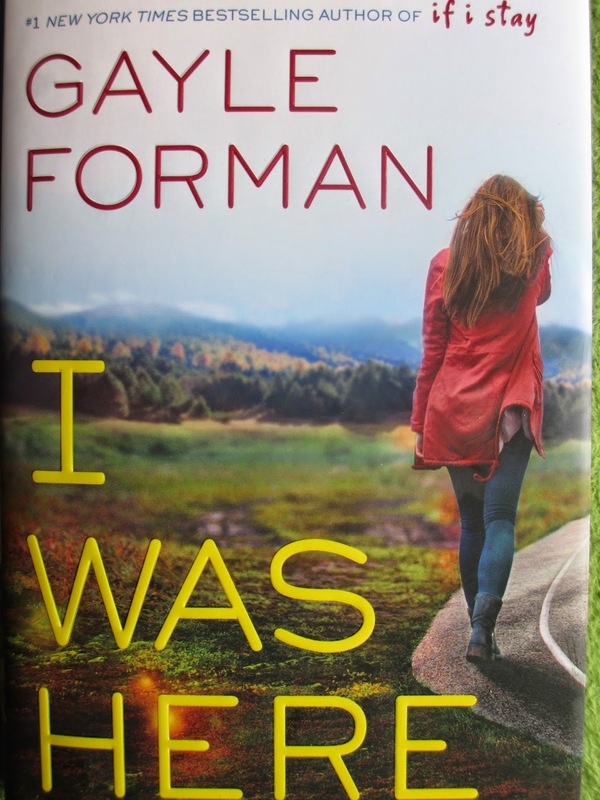 Anyone who follows Gayle Forman but hasn’t had a chance to read I Was Here yet knows it’s about a girl (well, she’s recently graduated high school) whose friend commits suicide; the book is the aftermath. And there's so much in these pages that just made me sick to read: it’s sickening to think of people ending their own lives just because they don’t want to live and it’s sickening thinking of people encouraging them to do so. So I didn’t enjoy this book. I tried to finish it as quickly as possible so that it wouldn’t drag out too long—I didn’t want to start getting depressed myself. And then that leaves me wondering what I even thought of it as a book. Maybe Gayle Forman was trying to do something different here and I by no means object to an author doing different things in different books, but I think of her books as the short reads I go to mainly for entertainment. There are a lot of issues she tends to bring up along the way, but never so much as this, I think. I’m not saying that suicide isn’t an issue and shouldn’t be talked about. I’m just saying I’m not sure what I think about wrapping up a social issue into a novel. It’s strange that I should say that, though, I who have often felt so at home with Victorian novels—they’re almost renowned for bringing social issues into fiction. Issues about social classes, the problems faced by the poor, hypocrisy, disabilities. And I don’t have a problem with that—is it just because they’re the problems of a different time than mine (which is in itself an odd thing to wonder because many of those issues still exist, in some form, today)? I don’t know. What’s also strange is that, even though they’re very different writers, I sometimes think of Gayle Forman and Laura Wiess similarly (though Laura Wiess tends to focus on teenage girls, her books aren’t really considered YA). And last year Laura Wiess came out with Me Since You, which was also about a young woman who deals with someone close to her committing suicide. Except that book was more about a portrait of grief, a letter about traveling slowly toward accepting and moving on from what had happened. Though it was a sad book, I liked it, in a general way. So why am I having trouble with I Was Here? Maybe it’s because this book got more into the reasons why people take their lives, versus just focusing on grief at loss—maybe that’s what was harder. Maybe it’s because I’ve been reading too many sad things lately that my head’s trying to avoid turning morbid. Or maybe it’s because I didn’t feel like there was enough hope in the way that this book ends. As Cody tries to figure out why her friend didn’t want to live anymore, she also has to overcome that tiny part of herself that doesn’t want to keep struggling, and she succeeds. But I didn’t feel as much power in her realization of staying with life as I wanted; I wanted more. After the dark places where this book went, I wanted a fuller and more complete ending . . . otherwise I’m not sure what the point was (in a literary sense) in the characters and the readers being sad about Meg’s death. Or maybe my distaste had only so much to do with the suicide aspect. Maybe I'm also wondering if Gayle Forman has been writing too many books too quickly. I'm beginning to recognize her character types, and that pulls me out of the realm of fiction. The rough around the edges guys who sleep around until suddenly they fall in love with the main character, who usually hasn't slept with anyone but is quick to with this guy. I'm getting tired of that construct. It also didn't help that Cody kept complaining about her small town: I understand her complaints, but the town itself isn't the problem in her life and as a small town, I wanted some reconciliation with that aspect of her life in order for her to feel like she had made any kind of personal journey. She doesn't need to like the town or stay in it; she just has to reconcile that hatred. For the thousandth time, I don't know. I just hope that I enjoy Gayle Forman's next book more--or I might stop reading the new ones. You know that effect everyone talks about, where all the things you're reading in different classes (no matter how different they are) suddenly converge and seem like they're all expressing the same exact theme and message? Well, I've been having that experience lately despite being some time out of college. I watched Swept from the Sea (which is based on Joseph Conrad's story "Amy Foster," which I really need to read) and Divergent and certain things about them seemed so similar in my head that at one point I was thinking of a quote that I literally couldn't remember if it had come from one movie or the other. I read the Divergent trilogy. I listened to "Beating Heart" and then bought the Deluxe Edition of Ellie Goulding's Halcyon Days and somehow ended up listening to it in tandem with Fireflight's two new singles from their upcoming album, Innova--and the sound of everything was coming together. I went to Picacho Peak (State Park) and reread parts of The Host (which takes place in that area). 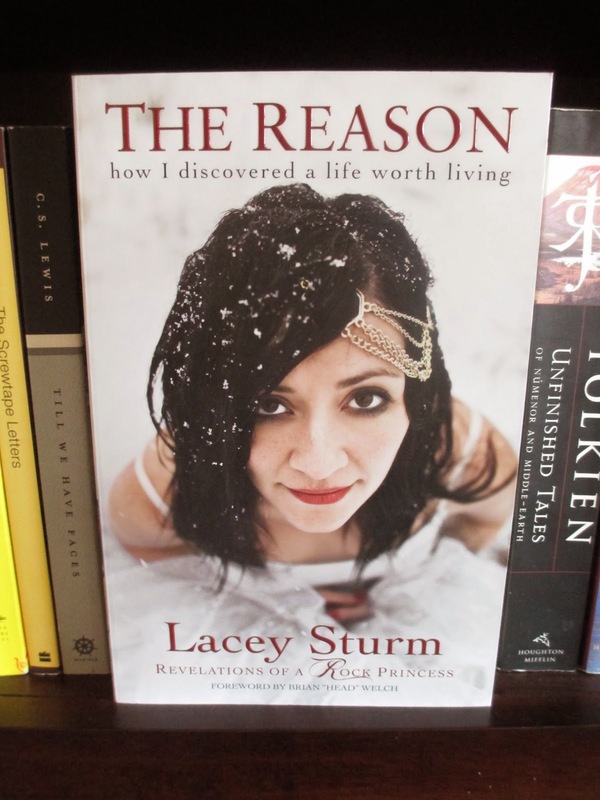 And I read Lacey Sturm's autobiography, The Reason (she was the singer in Flyleaf before she stepped down). And it is all converging into this one theme and I can't separate any of it because I'm just seeing connections everywhere, in these things and everywhere I look. Though this book came out towards the end of last year, I didn't hear about it until January. I already knew a little of Lacey's story, but given how much I love Flyleaf, I really wanted to read her book. At the same time, I think this book was what I was expecting and something a little more. Before I get into that, though, I just want to take a moment to appreciate Jordan Clarke's illustrations: they add just the right touch and perfectly express what is on the page. Coming in, I had thought it was more of an autobiography. It is--but not entirely. Lacey gives out the most details for the early days of her life, then she focuses more on a thematic journey through the following years, giving descriptions of certain important moments. So I think if you want it to be an autobiography as in a detailed account of every stage of her life and everything she's done, then you won't be getting that. Her focus is more on the theme of her life--just like Flyleaf's music, in fact. It's the story of going from rebellion and obsession with darkness to discovering the light. That in itself is powerful, as is Lacey's deep commitment to telling this story. For me personally, I think there were two things that stood out to me most. First is Lacey's love of people. It's easy to say that you care about people but then forget that the people around you at a store or class or work or hair salon or wherever you happen to be are these people--everyone you come across deserves your respect and your love and it's easy to stray from that, whether in making fun of a stranger's outfit behind their back or saying something rude or whatever it might be. That is no way to promote light. The second thing was empowerment (you see my connection to Divergent now, right?). Maybe as a quieter, I'd-rather-stand-in-the-back-than-go-up-front type of person, this was something I really needed a reminder of. There is power in knowing that there is a God greater than you who watches over you and helps you in all that you do--alone, what can we do? But if we are not alone, then we need not fear or cower in the background; we can. We can live and we can do. Here is where you start playing Fireflight's "We Are Alive." Or if you'd rather stick to the Flyleaf theme, try "Fully Alive," "All Around Me," "New Horizons," and "Beautiful Bride." That last song played in my head quite a bit as I read: it's that feeling of unity. Let's not forget that unity. It's been a busy weekend, I guess. I keep meaning to put up this quick post, but the days keep finishing so quickly and then I'm too tired to bother. I guess it's just been such nice weather (sunny, after too many days of clouds) to want to do much indoors, at a computer. But here it is at last. 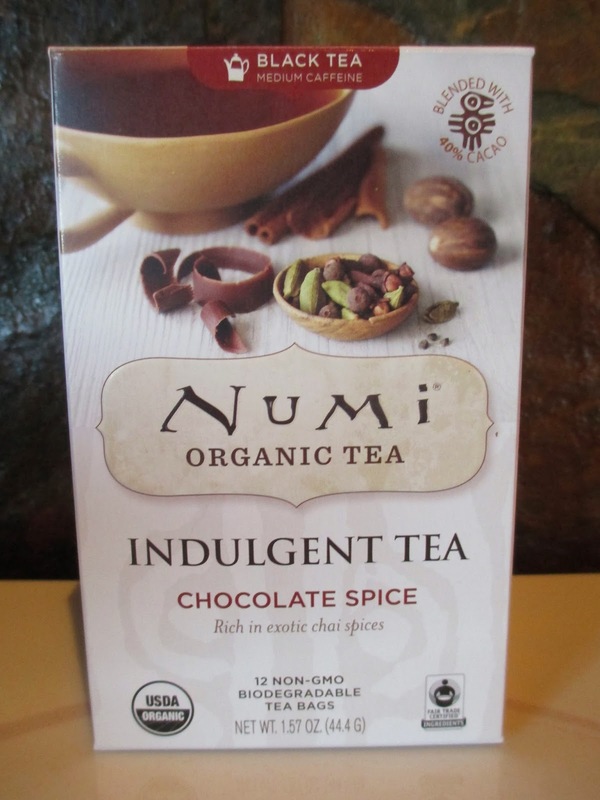 Moving on through Numi's range of Indulgent Teas, I've come to the Chocolate Spice variety--which is basically a chocolate chai. It has cocoa powder, black tea, cinnamon, ginger, cardamom, cloves, nutmeg, and star anise. The tea bags smelled too much of anise to me--but I guess that was an unfair, premature observation. You have to brew chai tea for a long time and make it with milk (or, you know, almond milk). The box says six to eight minutes, so definitely don't go less than that, otherwise the flavors don't settle in. Thankfully, anise isn't the star flavor in the taste: the cinnamon, cardamom, ginger, and cloves also come through. The thing is, there isn't very much chocolate left behind all those other strong flavors. The milk does give a feeling of sweetness that almost gives the illusion of being able to taste chocolate, but really it's a very mild flavor. More than recognizable chocolate taste I think you get more of that earthy texture of flavor instead. So it all depends how you label it. I've just finished my box (12 tea bags isn't very many), and I enjoyed it--definitely more than the Chocolate Earl Grey. But I don't feel like I got much of a chocolate tea experience. And isn't that what this line is supposed to be about? It's good tea--but I'm not sure there's anything particular that will make me want to specifically set out to buy it again. So, um, you can kind of already tell that this is going to be a quick read (quicker than most movie companions, that is) because the author's name (Kate Egan) isn't even on the cover or spine. Maybe also from the fact that I was expecting to find it in the section in the bookstore where the other movie books are kept--and instead it was in the teen section next to the Divergent books. While it does make sense to group things by subject matter instead of just genre, it didn't take long to find that this book is targeted at a certain audience--despite the fact that I like Divergent and I am not in that particular audience. My first movie companion was for The Lion, the Witch, and the Wardrobe; I was fourteen, and I was not overwhelmed by it. While I realize that there are more details to go over for a movie like that than for this one, I'm not just referring to the degree of detail--I'm talking about the way a movie companion is written. I find the Divergent companion a tad simplistic. Maybe even patronizing at times--in the way it's written. While I realize that the intention may be to make it an easier read for people who have never read a movie companion or are still a little young, I don't think this approach achieves anything. If they're teens (as I was when I first started on movie books), they'll get the hang of it easily. And if they happen to be younger and maybe the text has a little too much detail, well, they can just read as much as they want to and leave the rest be--it isn't necessary to dumb it down for the rest of us who really want to hear about how the movie was made. After all, it's a movie companion--not a visual companion. Visual companions are about pictures; movie companions need more text. And I don't like the font of the main text in this book, either. I don't know. I've probably exaggerated my point. I'm almost ready to just erase the previous paragraph because, contrary to my seemingly black negativity, I am glad I got this book. The details may be sparse and the tone simple, but I still learned a little. There are, at least, still plenty of quotes from the cast and crew--those tend to be the best part. It adds something to hear what an actor thinks of his character, or what someone on the crew finds compelling about the story. And behind the scenes pictures are always nice to have. I think my favorite sections were on the sets, costumes, and makeup. I've become so accustomed (with, say, The Hobbit) to films using sets and costumes in a thematic way--and even though this was kind of a mainstream action-type movie, that same concept holds. Characters blend with their environments and subtle differences in the way similarly-dressed characters look can give indications about their past and their choices. Final point: this wasn't my favorite movie companion, but I still like movie companions and I still like this movie, so I still enjoyed my time reading through it. I may be wrong, but I think this is the last volume in the Chronicles set. It's book five, The Hobbit: The Battle of the Five Armies - Chronicles: Art & Design. My goodness, what a journey this has been. I've always known movie companions tend to be sparse on information, but they will always seem very bare now after I've gone through such detailed books as these. But movie companions are good introductions to most of the departments that helped create a movie--the Chronicles books are more specific in their focus. By the time you get to this book, you wonder if there's really much new to go over. Yes, there was a third movie, but doesn't it mostly cover the same locations and characters seen in the first two movies? Maybe not as much as I'd thought. There's discussion in here about the destruction of Lake-town and the refugee camp its citizens set up, Galadriel's look for Dol Guldur, more sections of Erebor and Dale, new costume pieces for the dwarves and other characters, and some of the creatures and sets from the final battle. Besides, of course, pouring over all the used and unused designs, I enjoyed hearing about the collaborative side of design, specifically how it overlapped with plot. If a certain sequence needed stairs, then those had to be worked into a set--that sort of thing. I think this book, more than the others, showed more of that plot angle. So that made for a new way of looking at how the concept artists, Weta Workshop designers, and costume artists were approaching their tasks. My pre-ordered copy was signed by Alan Lee, Daniel Falconer, Nick Keller, and Gus Hunter.